1. Install the App into your Salesforce org. 3. If your web site forms are not Salesforce-provided web-to-lead forms, please add a hidden field named cloudamp__data__c to your forms. 4. 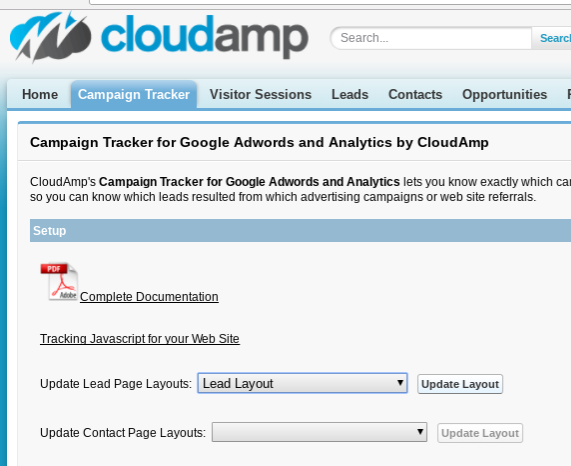 Update your Lead and Contact Page Layouts automatically with the tools on the Campaign Tracker tab in Salesforce. 5. We recommend tagging your Adwords and other advertising URLs with Google Analytics Campaign Tags. , and be careful not to add any line breaks. That's it! Once this code is pasted into your web site and published, the next time a visitor submits a form on your web site, their campaign and source information will be tracked. Please contact us for more information regarding your specific situation.